As you begin to build a portfolio for your wedding photography business, it can be necessary to have a diversified collection of photos to show potential clients. Although some locations do not require you to bring along any additional lighting resources, there are many shooting situations that need extra equipment. In the past, we’ve shared how to shoot with speedlights, as well as how to diffuse light. 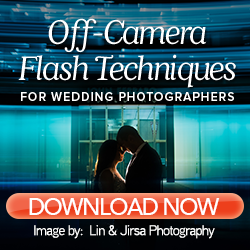 Today, we’re going to share how you can use strobes during your wedding shoots to create the perfect light. Strobes are off-camera lights you can position anywhere on location to help you shoot the images you desire. Unlike the flash built into your camera, strobes give you the flexibility to place the light in any position to capture the best shots. By having the ability to control the lighting in every image you take, you can create more consistency in your images before you send them to a photo editing company. Here are some simple tips to help you get started using strobes to capture dynamic images during your wedding shoots. 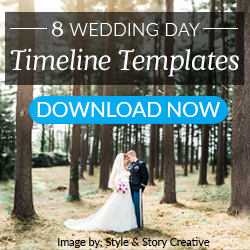 With every image, you want to tell a story or send a message that relates to the wedding day. Besides providing light for your shoot, strobes allow you to add in special effects to create a specific mood for the couples’ wedding photos. If you are lighting your couple from behind and also have a light source in the front, then you have the potential to evenly light the whole image while placing a rim light around your couple. 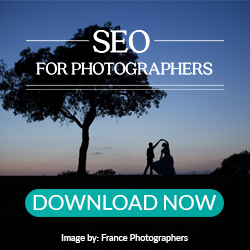 This will help you create a lighter feel to your images, while showcasing your couple. If you prefer a more dramatic mood for your images, adjust the placement of your strobes! Remember, the closer the light source is to your subjects, the softer the light will be on their faces. Try placing the light further away from your subject and at a 45 degree angle from where you are standing. This will increase the intensity of the shadows in the image, and draw your attention to a particular part of the photo as well. If you are looking to add additional drama, try underexposing your image by 1-2 stops, along with increasing the angle of your light. This will help emphasize the highlights and shadows in your image! During many wedding day shoots, you will be capturing images in an outdoor location. Often times, the sun can be harsh, and it may be difficult to shoot through the unflattering light. Without an additional light source, you typically have to decide if you are going to expose for the background or for your main subject. By incorporating strobes into your photos, not only can you include the details and colors from the sky, but you can also illuminate your subjects, regardless of the harsh light from the sun! The light from a strobe can be strong enough to overpower the sun, giving you complete control of the situation. For example, if you want to include the deep, blue sky in your photos while creating a dramatic light on your couple, a strobe is a great way to achieve this. By setting the exposure on your camera for the background and then adjusting the strobe to properly light your couple, you will create a dynamic image. Related: We’ve pulled 26 key tips from Roberto Valenzuela’s Picture Perfect Lighting – use them to advance your lighting knowledge! Tip: Strobes are also useful indoors! If there is no natural light in your location, add a soft box onto your strobe to achieve a light that resembles natural light. Place the strobe to one side of your subject as well to make it look as if the light is coming from a window. Although unflattering light may cause issues during your shoot, there are ways to use strobes to create flattering shadows. One simple way to do this is by creating butterfly lighting, which only requires one strobe. Butterfly lighting is created when you angle the light to fall on your subject’s face with minimal shadows. Place the strobe behind you, higher than you, and at a downward angle. If you have a second shooter, you can have them assist you in holding the light – otherwise, place it on a light stand. From here, stand in front of the light as you are shooting. This will cast a flattering light on your subject, and it will also reduce the number of shadows that would have distracted from the focal point of your image. Creating butterfly lighting is simple to do, and it is a great setup to use to take a portrait of the bride. Understanding how to use lighting during your wedding and engagement shoots allows you to be a more versatile photographer. In addition to this, it helps you become comfortable shooting in any situation, regardless of the lighting you are faced with. Remember, strobes are more powerful than speedlights, giving you even more control over how you want each image to look. Take time to practice using strobes so you can comfortably use them during your next shoot! Download our Pro Photographer Lighting and Posing Guide to learn more advanced tips and tricks to use during your shoots.